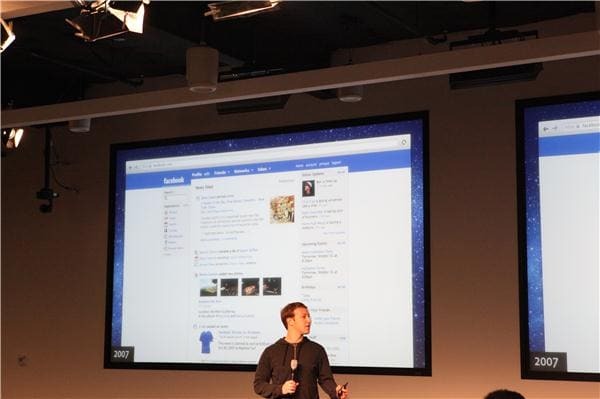 At a live press event today, Facebook announced a major overhaul of News Feed, the front page of Facebook. Facebook founder and CEO Mark Zuckerberg started off the announcement by saying that “we’re trying to give everyone in the world the best personalized newspaper we can.” His statement sums up the goal of the redesign: make the News Feed more than just a stream of random posts, but your main source of social, news, music, events, photos, and other content. 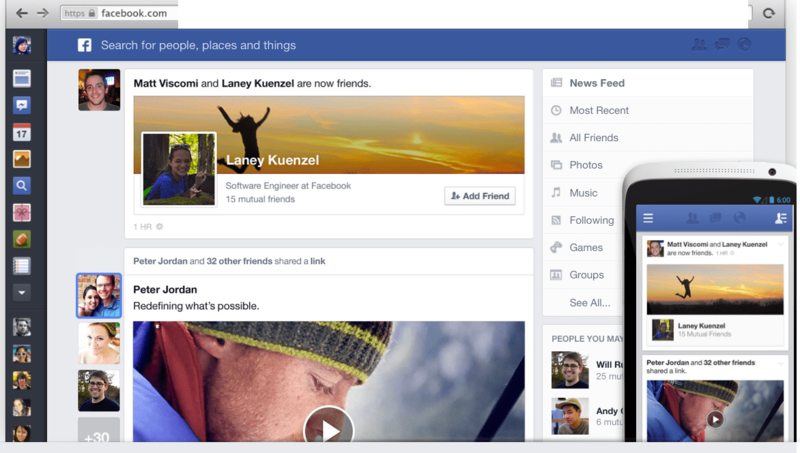 Several Facebook employees spoke about the design changes, which are intended to reduce clutter. With the old News Feed, ads and articles were mixed in with your friends’ posts, which made it hard to catch the content you really care about. 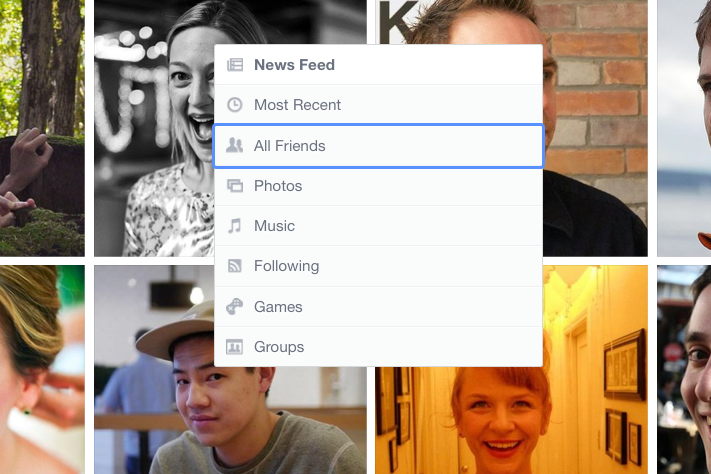 The new News Feed gives users a “choice of feeds,” which lets you filter posts by type. These feed types include music, photos, games, and “following,” which displays all content by any public figures or brands you follow, and which is already receiving comparisons to Twitter. It’s clear that Facebook envisions the “following” feed as the front page of the news and hopes that its users will adopt it that way. You’ll also see more personally-tailored posts based on what you’ve Liked in the past: local events, articles, and other things about what Facebook thinks your interests are. One feed that sounds promising is the “All Friends” feed, which contains only the things your friends post in chronological order. If we’re understanding that correctly, it means no ads, which would be a welcome change for most Facebook users who don’t love seeing Sponsored Stories clutter up their News Feed. 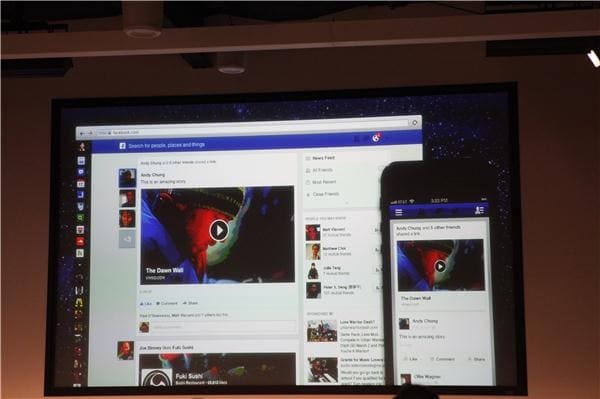 One Facebook speaker said that non-friend content makes up about 30% of the News Feed right now. The new design, which will be rolling out in limited fashion starting today, looks the same on a desktop as it does on a mobile phone or tablet. The designers stressed that the “very mobile-inspired web design” drove the new style. There’s a lot more emphasis on the center News Feed panel and more space allotted to it, as well as more focus on photos. The interface looks quite similar to Google+ in many respects. The updated News Feed: same look on your computer and your mobile device. So what’s in it for Facebook? Well, the social network makes 85% of its revenue from advertising, and no redesign would move forward unless it helped support Facebook’s bottom line. CNET’s Casey Newton commented in a live blogging session that Facebook’s monetary incentive is that “the new news feed will allow for the kind of giant, glossy brand advertising that companies love. That’s why Zuck kept comparing it to a newspaper — newspapers commanded very high ad rates once upon a time. Facebook would love it if those ad dollars shifted their way.” The design change also shows that Facebook’s putting mobile front and center, trying to demonstrate that it can be just as dominant on mobile as it is on desktop. Limited rollout of the new News Feed starts today. You can preview it and sign up to try it at Facebook.com/newsfeed. Once you see it, tell us what you think: is this something that people will actually like, or will it cause an onslaught of status updates of people saying they’re going to quit? I just installed DONotTrackMe for Safari and its great, thanks! I want to kno why, in the menu bar icon for the App, when I click the MaskMe option to find out more about that software, my browser is hijacked to the Google Chrome store and it tells me I need to install Google Chrome??? Are y’all aware of this? Hey, glad you like DNTMe and thanks for the question. MaskMe is only available for Chrome and Firefox right now, so because you’re a Safari user, you *should* have been directed to a page that’ll let you sign up to get MaskMe for Safari when it’s ready (which will be soon). For now, you can just go to http://www.abine.com/signup/maskme/ and sign up there, and we’ll fix that link. Thanks again! DoNotTrackMe is just awesome extension, it makes your browsing much more secure, I feel safe while browsing the internet, no one is tracking me which is very important, very well built extension and with awesome customer support. Just in one week I already have a silver medal earned and I have blocked 5010 already, this is just awesome, try it yourself, you won’t regret it. Hello guys, I ran across your website reading an article and reading one of the comments in the comment sections. One fellow had it and he loved it. I am presently using IE8 on a Windows7 Home Premium platform. I installed this program last night at 3am EST. I have only been on the internet for about 4 hrs in almost this 24 hour period. Since then, 703 companies have been blocked from seeing me. Some of which I have no idea who they are. Facebook has been blocked 118 times in the same time frame. Its simply amazing!! Thank you for such a wonderful tool!!. Your articles are so helpful – informative and educational. My question is: Should I install Google Chrome? Based on your suggestions as to Google tracking, I have felt it wasn’t necessary as Microsoft Explorer has been my browser for as long as I’ve had a PC. However, a tech from Barnes and Nobel suggested installing Chrome to locate downloaded Nook e-books from the B&N website. Another question in reading the comments I realized although I signed up for DoNotTrackMe and your e-mails, I have nevery seen how many sites tried to track my computer browsing..Where is that information? Thanks for keeping us safe.